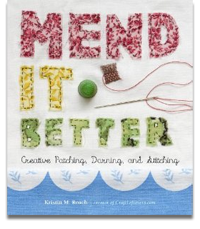 I first heard about Mend It better via a Bath based Tweeter, mender, and contributor Eirlys Penn, which is interesting as the book itself is American and written by Kristin M. Roach of www.craftlovers.com. It’s not the usual type of book that I review but it is self help. It just happens to be about self help of the mending, fixin’ and patching variety! And I loved it so am sharing it with you now. Make a rule for yourself, as you venture from thrift shop to yard sales, to never pass up a fine fabric just because it’s not useful any longer for the purpose that it was intended. Good cloth is good cloth and often its next life is more exciting than its original. The other thing to mention is the sheer physical pleasure in holding the book. I suspect with the advent of eBooks that publishers are playing to the tactile sensibilities of real book buyers. The book has a thick padded cover and is full of beautiful coloured illustrations and photographs, something Kindle can’t yet compete with! I loved holding it and riffling through it’s pages. This book will remain a fixture on my bookcase and may get loaned from time to time to craft minded friends and family. It is full of inspiration for new ideas and ‘re-purposing’ and somehow this book does more for me than just tell me how to do things. It is a comforting, enjoyable book and reading it I feel I am joining and connecting with a long line of venerable, thrifty women from the past. Great review Jane – and so refreshing to read about the preservation of something ‘crafty’ that is at risk of becoming a dying art. When we mend something we give it new life and it also symbolises our respect for the things we have and for their heritage. A good antidote to the ‘buy it and throw it away’ attitude that pervades modern living. Thank you. This book I have only seen briefly, but am so wanting my own copy now! The layout is brilliant and all you want to do is dive straight in and see what you can do. Great review Jane! Thanks Heather and Karen for your comments. It is a really lovely book and such a departure for me from my normal reviews. I hope it does well. Delighted that you enjoyed the book. I was really happy to be picked as a contributor (my fix was a tattered apron), and must confess to being that Bath-based tweeter you mentioned! You might be interested in a new group that has kicked off in Bath called the Big Mend. We meet monthly on the last Wednesday of the month for a 2-hour session of social button-sewing, sock-darning and jeans repair, amongst other things. It’s a real tonic to sew in a large group, and I’m sure this experience harks back to something extremely old in our human experience, scrawled in our DNA. The venue hasn’t been confirmed for the next session on 27th June but do go to the Big Mend page on my blog and you should find latest details posted there. Thanks again for featuring the book. Thanks Eirys, I have given you due credit and a link to your review which is far more comprehensive than mine. I’ve been looking at your mending classes and may just join you! I have a huge fur (fake obviously) coat which makes me look like I’ve just failed an audition for Cats the Musical, but I love it. The lining is torn and that’s so difficult to mend without decreasing the size of it. If you see a woman turn up trailing something big and furry behind her it’ll probably be me!